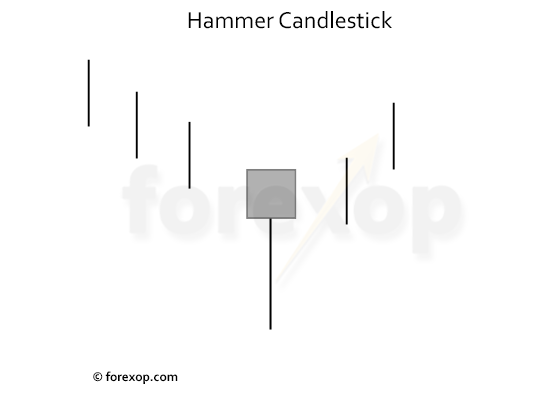 A hammer is one of the more important reversal patterns that traders should be aware of. The hammer is treated as a bullish reversal, but only when it appears under certain conditions. A typical hammer candlestick has a short body with almost no upper shadow and a long lower shadow. The long lower shadow or wick implies a short, but significant price fall where selling demand was high. The body color of a hammer is not as important as the shape and location. Body can be either black or white forming either a bullish or bearish candlestick. 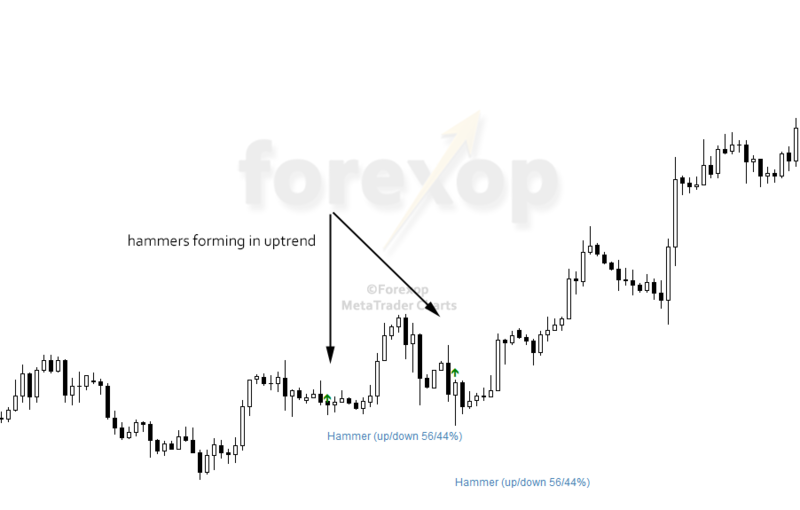 The most important feature of the hammer is where it forms within a trend. The candlestick’s lower wick or shadow should reach or be very near to a price low within the trend where it occurs. Hammers can develop either at bearish trend bottoms or in bullish trends where the market is retracing lower. Hammers can also form with the shadow above the body. These are known as inverted hammers. When an inverted hammer appears in an uptrend it’s known as a shooting star or bearish hammer. These are typically treated as signs of a potential bearish reversal. The form of the hammer is identical to that of the hanging man. The only difference is the position. If the pattern forms at or near a trend bottom, we call it a hammer. When it appears in a rising market we call it a hanging man, and the pattern is then a bearish sign. The conventional wisdom is that the hammer represents a flip in sentiment. The long lower shadow means that the market tested a lower price range for a short time but then recovered. With significant hammer patterns at longer time frames, the shadow will reach a low support level before recovering. At that point some of those holding long positions will have been forced to sell. This can cause a triggering of stop loss orders temporarily pushing the market lower as selling volume rises. This can add to already bearish sentiment. Adding to the bearish sentiment, powerful selloffs can often produce a high number of margin calls. When this happens brokers close out positions with sell orders at market prices. As most of the sell orders are triggered by the deep low this can create buying interest. New buyers enter the market to take advantage of the lower price and this can drive the market up again. When trading the hammer, the place in the chart at which it appears is decisive. The same pattern in a rising market can have a completely different interpretation. To be a bullish signal, the shadow must reach a recent low within the trend. Figure 3 shows examples of valid and invalid patterns. If the hammer forms in a downtrend, but doesn’t reach a new low, this is a mixed case and is typically not treated as a reliable reversal signal. Trading the hammer pattern means looking for reversal signals that are likely to create high quality entry points for buying. 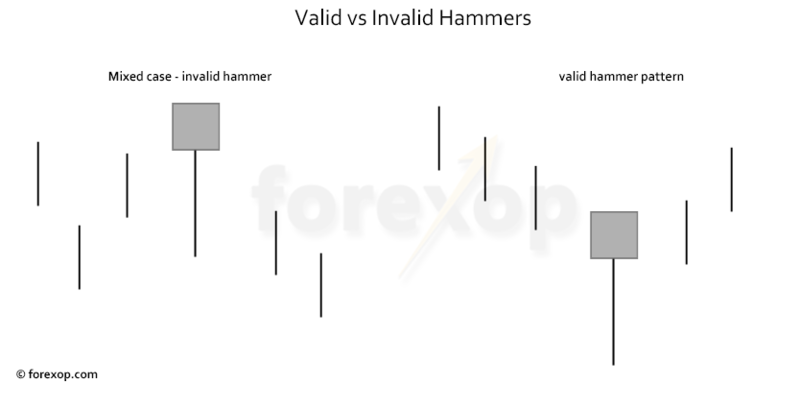 In forex charts, a hammer pattern on its own often isn’t a reliable entry signal. Looking at historical charts, the predictive ability of this pattern is only about 45 percent to 55 percent. That means it’s always necessary to filter the weaker cases and to look at the history of the chart across that time frame. Any of the above pointers can help to assess the state of the market at that time. A lower risk approach is to trade hammers in an already rising market. Going long in a rising market in most cases will be less risky than trying to time the exact instant of a trend bottom. Hammers do regularly appear in uptrends, as the chart in Figure 4 demonstrates. These occurrences form in the dips as the market retraces after each rally. When trading in this way we can make use of other techniques such as Elliott wave analysis, Bollinger bands and moving averages to try to time the trend and the expected pullbacks. Hi, I know a guy who has powerfully mastered this formula and making $$$ a month. Hammer is called hammer for a reason. 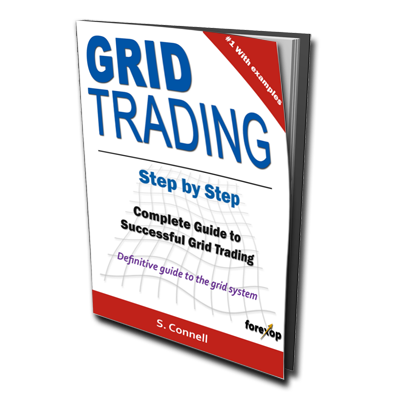 This strategy can crush the barriers and make you money consistently.